Just so you know, I'm a complete n00b when it comes to anything Linux! So... where to start?! At the beginning of course! 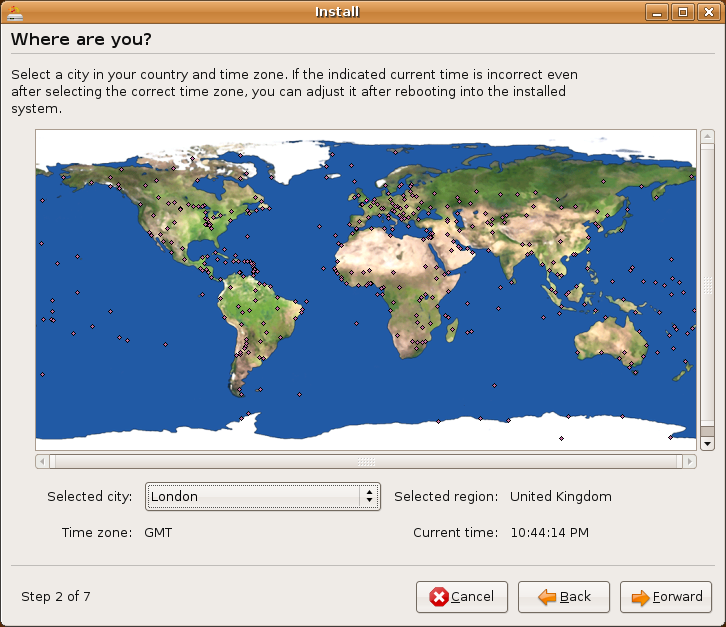 Goto http://www.ubuntu.com/ and download the desktop edition of v7.10 from a location near you. Once that's finished downloading (it may take a while! 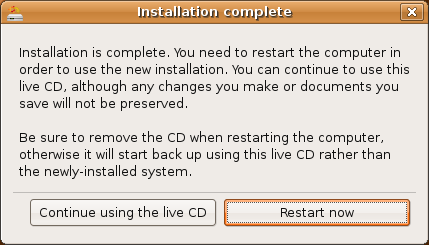 ), burn the image to a disc. 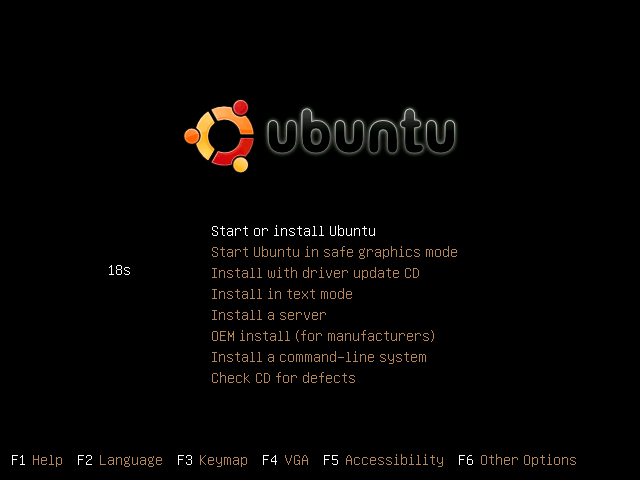 With the 'bootable' Ubuntu disc inserted in the drive, boot up the PC you want to install it on. 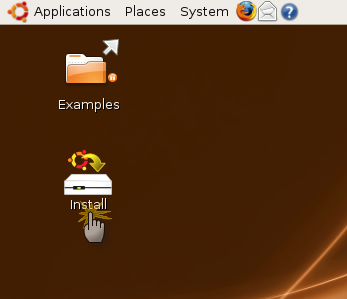 When presented with the startup menu, select the first option - 'Start or install Ubuntu'. Wait for it to load the desktop and then double click on the 'Install' icon on the left. 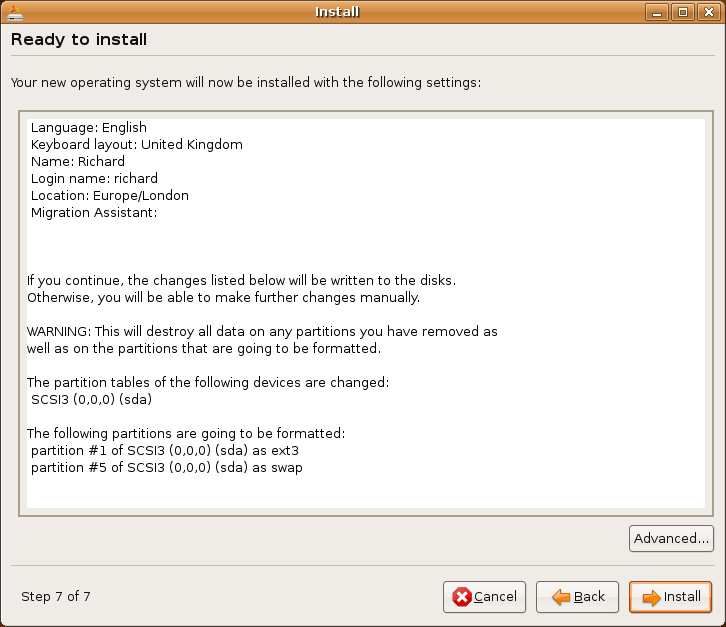 Step 1 - Select a language for the installer. Step 2 - Tell it where you are. 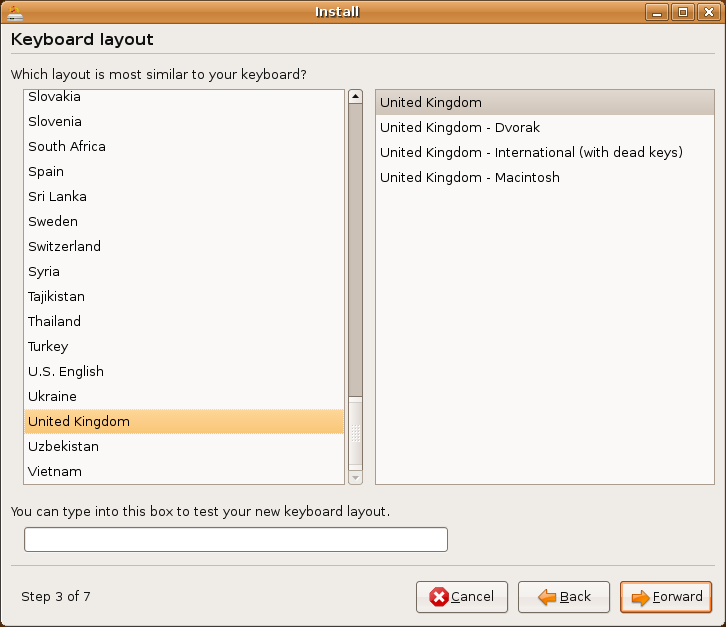 Step 3 - Select your keyboard layout. 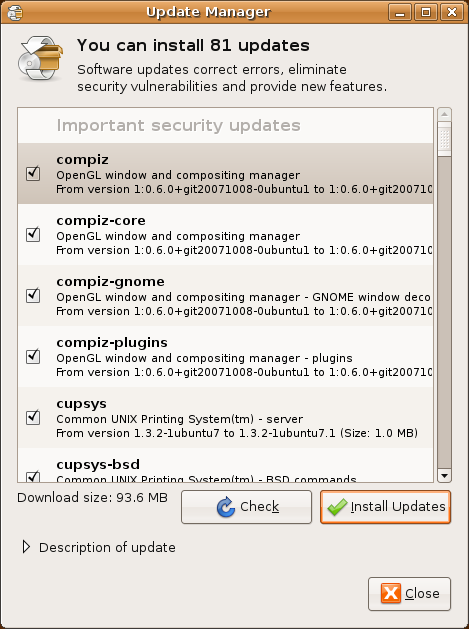 Step 4 - Configure your partitions. Step 5 - Unknown - only appears if you select 'Manual' on Step 4? Step 6 - Tell it who you are. Step 7 - Ready to install. So when you're done, click the 'Install' button and away it goes! Do as it says and remove the bootable disc from the drive, then click the 'Restart now' button. 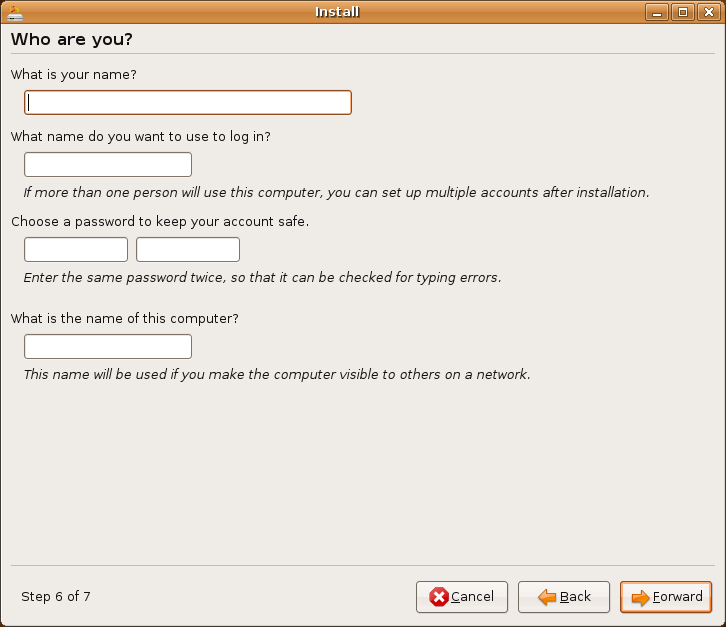 Once the machine has restarted and Ubuntu has loaded back up, login using the name + password you entered back in Step 6. I guess the next thing to do is check for updates?! Updates are Good! Click 'System' in the top menu bar, then hover over 'Administration' for a second until the next menu appears, then click 'Update Manager'. Next, click the 'Check' button and type in your password again if/when prompted to do so. Once it's found them all, click the 'Install Updates' button to install them. Click 'Close' and you're good to go. At this point I chose to reboot the machine. I know it didn't actually tell me to (and I believe it does when it needs to), but I just feel happier doing it! If you haven't already figured it out, you can reboot by clicking the red power symbol in the top right corner of the screen. Now that's all done, it's time to install Wine. 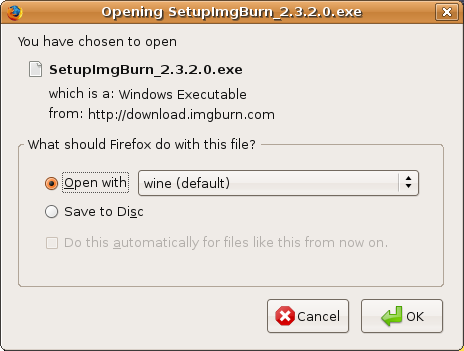 ImgBurn is a Windows application, hence Wine is required to act as a go-between for it's code and the native Linux API. 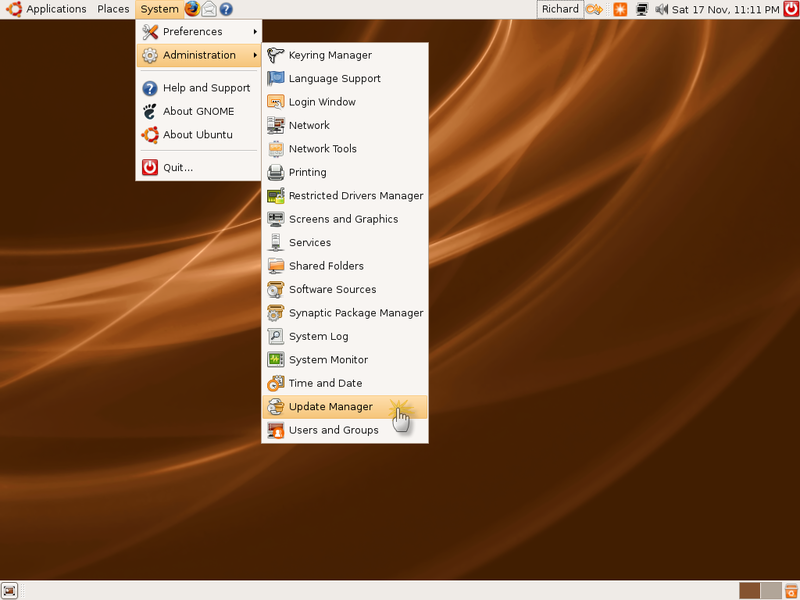 Normally when you want to install an application in Ubuntu you'd do so via the 'Synaptic Package Manager' which you'll find on the 'System' -> 'Administration' menu that we saw earlier on. The trouble is, at the time of writing this guide (and this will probably still be the case when you do it), the version of Wine available on there isn't actually the latest and greatest one. To get the latest one we need to tell the package manager where to get it from. As a hint for complete n00b's, you can find the 'Terminal' program under the 'Applications' menu and then 'Accessories'. As that last web page said (you read it properly yeah?! 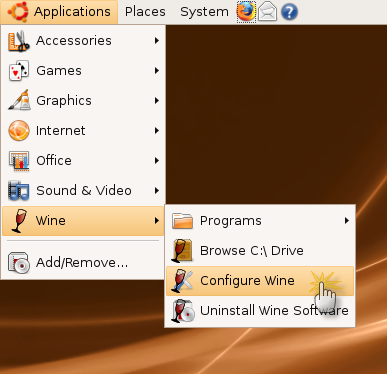 ), you can install Wine in 2 ways. 1. Via the 'Terminal' window you already have open. 2. Via the 'Synaptic Package Manager' application. 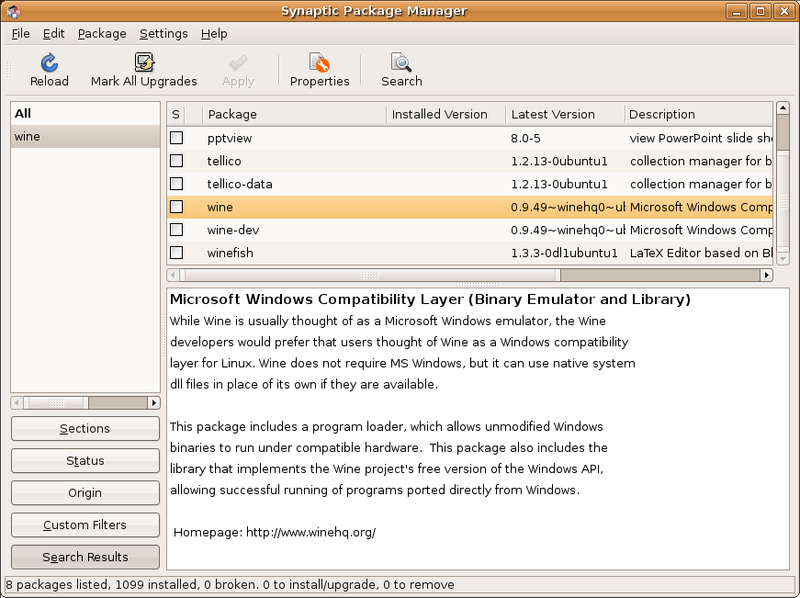 If you want to go the Synaptic Package Manager route, load it up from the System -> Administration menu. Firstly (and this is very important), click the 'Reload' button in the top left of the window to update the package information. Now click the 'Search' button and type in 'Wine' (without quotes) before then clicking 'Search' again. 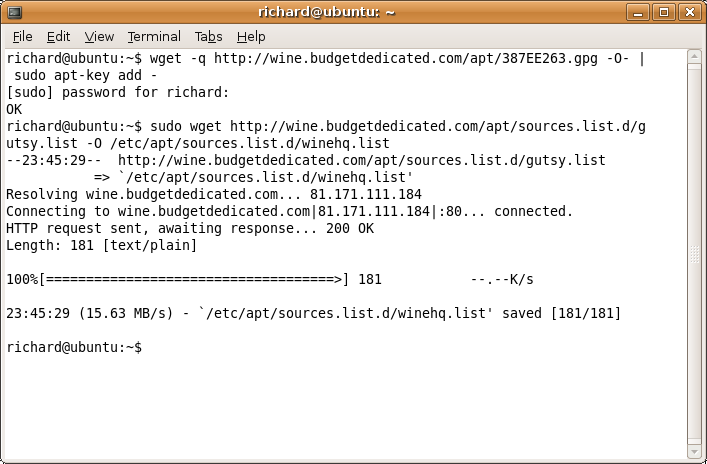 Locate the 'wine' package within the list and double click it. If you're prompted to mark additional required changes, just click the 'Mark' button. Now click the 'Apply' button. When prompted to 'Apply the following change? ', just click the 'Apply' button again. Bring up the 'Applications' menu at the top once again and you should see a new branch on it called 'Wine'. Go to it and click the 'Configure Wine' option. Click the 'Ok' button so the window closes down. Right, now all that's left to do is download ImgBurn and install it! Load up FireFox, goto http://www.imgburn.com/ and click the 'Download' link. Select whichever mirror you want to and start the download. Firefox will ask if you want to open the file or save it. You should notice that 'Wine' is now the default application to open it with. With the 'Open with' option selected and 'Wine' as the application, click the 'Ok' button. You can then go through the normal ImgBurn setup wizard. 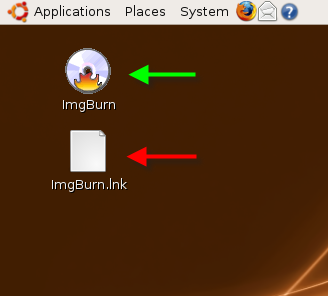 When you're done with that, remove/delete the 'ImgBurn.lnk' file from your desktop (shown with the red arrow) - it's just the normal (Windows) ImgBurn shortcut file only they're not valid on Ubuntu. Wine will have automatically created a proper one for you. 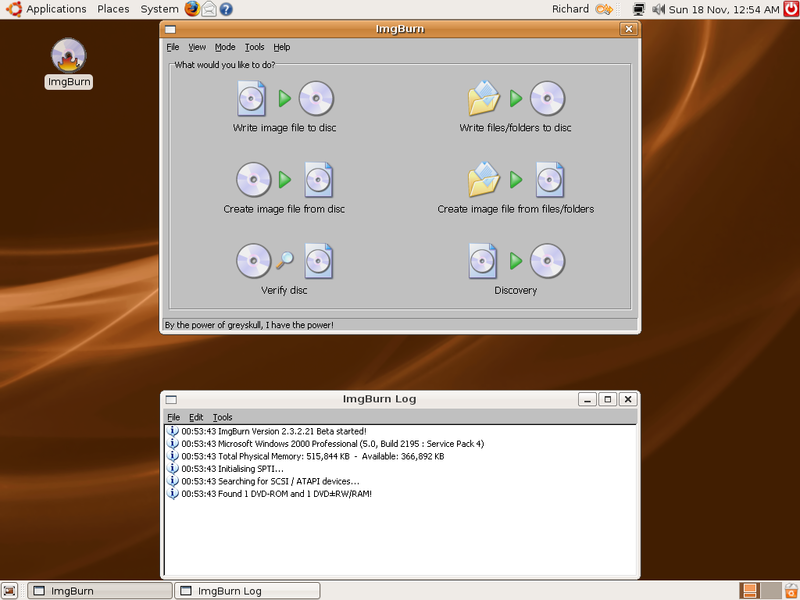 To run ImgBurn, simply double click the ImgBurn on the dekstop (shown with the green arrow).